My Volta in the field. Last year my wife bought me a Cotopaxi Volta Rolltop, a backpack I’ve come to know and love. After using it for a few trips, some car camping, and as a daypack, I wrote a review declaring it an amazing pack that did everything I needed, with few complaints. Now, roughly a year later, I’ve used and abused the bag on a number of different occasions, and have decided to update my review with some additional information and insight. Will my praise stand up to a year of use? Read on to find out. The Cotopaxi Volta in Beechwood Canopy. Full disclosure; I am a Cotopaxi affiliate, so if you follow my links to their website and make a purchase, I may receive a commission. I have not been compensated for this review, and all opinions expressed are my own. Over the last year I’ve strapped my Volta onto my back for all manner of trips and activities; weekend car-camping, several day-hikes, a number of trips to visit family, overnight camping where I had to carry everything in, and flying across the country. If I’ve needed a mid-sized backpack, I’ve carried the Volta. 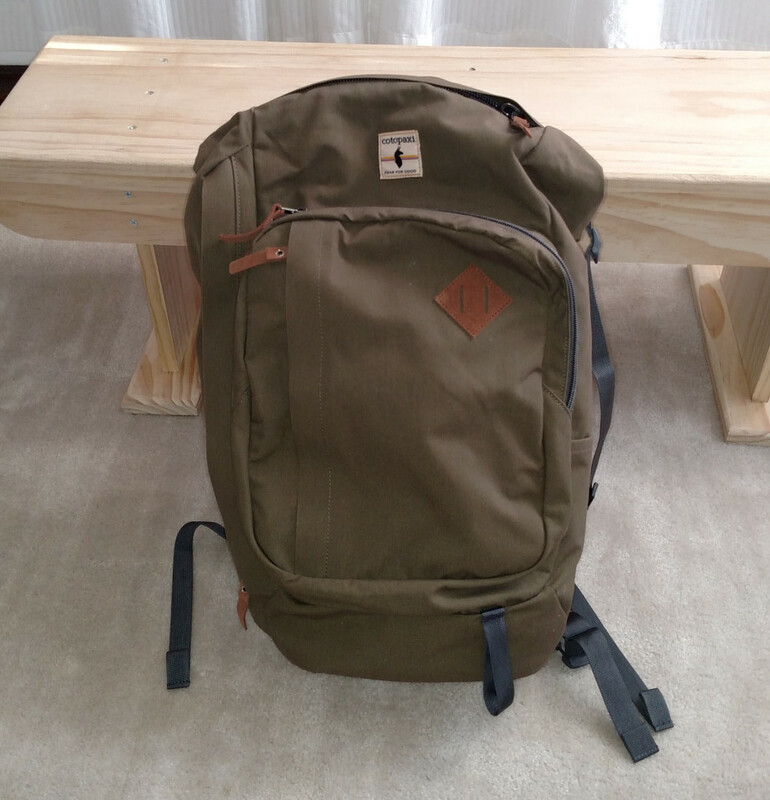 I’ll give you the run down on the pack itself, but first let me tell you a bit about Cotopaxi, and why I like them. Admittedly, this might paint a biased picture for the rest of this review, but you’ll just have to run with me on this. We create innovative outdoor products and experiences that fund sustainable poverty relief, move people to do good, and inspire adventure… Cotopaxi funds nonprofit organizations that address the most persistent needs of those living in extreme poverty. Our primary focus areas are health, education, and livelihoods. So when you read Cotopaxi’s slogan, “Gear for Good,” understand that it isn’t just marketing ploy; they believe it, they live by it, and that’s awesome. Do you know what else is awesome? All of their gear is guaranteed to last 61 years. Why 61? It’s the average lifespan of someone living in the underdeveloped world. It’s a good reminder, that we can wear on our backs, that no matter what problems we’re facing, we are pretty lucky. And if you decide to get some gear from Cotopaxi, you know that you’re also paying it forward and helping to make someone’s life just a little bit better. So yeah, I really like this company and support what they do. But not enough give this bag a positive review if it didn’t deserve it. That’s not the case though; the following review is honest and will tell you what I think of the Volta, warts and all, but truth be told it’s just an incredibly great pack. So where has it been? All of my possessions for this weekend made the trip in my Volta. Okay, that isn’t true in the strictest sense. Since we were car-camping, we brought a lot of stuff with us for comfort and enjoyment. Coolers, a Rubbermaid tote for dry goods, camp chairs, an axe, a dutch oven, etc. None of those items, (or the tent and sleeping bag) were in the pack. What was? Pretty much everything else I took. Three t-shirts, one pair of gym shorts, one pair of cargo shorts, two pairs of socks, one pair of boxers, one underarmor shirt, two towels, two raincoats (one for Clarissa), and my dop kit (toothbrush, toothpaste, deodorant, and soap). There were some smaller items tucked in as well, such as my Field Notes book and a small pencil, a fixed blade knife with a firestarter, and a Thermacell with which we were experimenting. The Volta can hold a lot of stuff! Since we essentially got to the site and unloaded gear, the Volta didn’t see a lot of walking on that trip, but it’s capacity came in handy. Using the rolltop was new to me at the time, never having had one before. 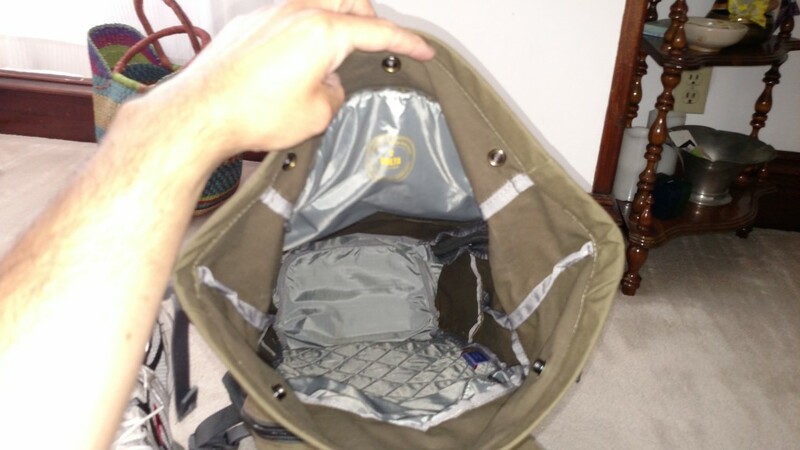 It would be difficult to get stuff in and out of the pack if what you’re looking for isn’t near the top, except that it has a side zipper as well, so you can navigate the contents without removing everything. It’s handy, so long as you plan ahead (more on that momentarily). 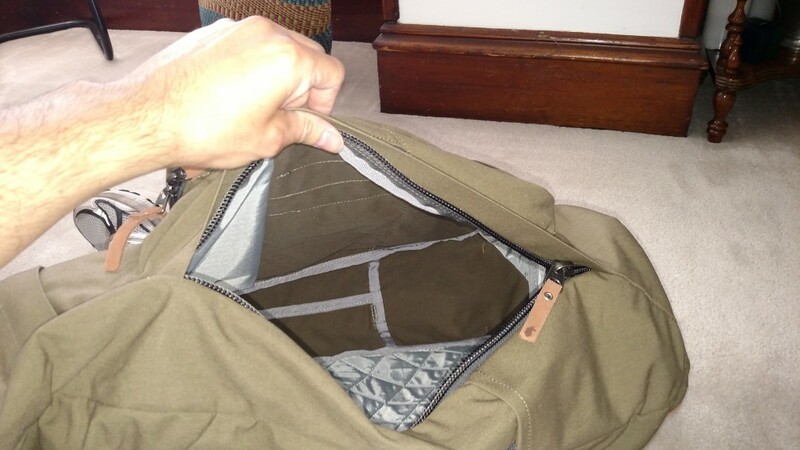 The side zipper means you don’t have to dig everything out from the rolltop to get at something that’s in the bottom of the pack. I took the Volta on two or three day hikes early on, carrying a bit more gear than I needed to; lunches, sunscreen and bug spray, inexpensive rain ponchos for everyone (just in case), and water bottles (one in each side pouch). Though the Volta carried these items without an issue, the short day hikes aren’t really where it shines. Since there isn’t any internal structure, when the bag isn’t full, things move and shift inside of it. This isn’t a significant problem, but if you’re used to smaller day packs, you might feel like your stuff is getting jumbled. The lack of weight inside the pack also led to it riding up, and I had to do some readjustment here and there to keep it comfortable on my back. The longest hike I took it on in these conditions was roughly eight miles, and it was perfectly serviceable, and quite comfortable, but it seemed like I carried more pack than stuff. I have since purchased the Cotopaxi Luzon, which has proved to be much more suited to what I need out of a pack for dayhiking, so I no longer use the Volta for that purpose. It can take a little adjustment to find the sweet spot, but once you do the Volta is pretty comfy. I pretty much lived out of my backpack when Clarissa and I went on our honeymoon. I didn’t pack my boots or my Luzon daypack, but everything else I wore and used that week was hauled in the Volta. That’s a pair of jeans, a pair of shorts, five pairs of boxers, five undershirts, five t-shirts, one jacket, several pairs of socks, one dress shirt, and one pullover. Then add to that my toiletries, laptop, and all my relevant chargers as well. I continue to be impressed with how much I can pack into the Volta. Of course, the farthest I had to carry it on this trip was from the Sportage to the hotel and then back again, but that’s a perfectly reasonable situation in which to find oneself, and my pack manages it quite well. During my December trip to Southern California, I just took my Volta. One bag, that’s it, and I didn’t check it, I carried it on with me. True, it was only a brief trip (four days), and I intentionally packed light, but keep in mind that includes packing an extra set of clothes and shoes to wear when we ran the Spartan Race. So I carried everything for race day, an extra pair of jeans, four t-shirts, my dop kit, as well as boxers, socks, and undershirts for the week. Once again, I managed to pack everything I needed for a trip, and in this instance, it fit into the overhead compartment without any issues. The Volta excels for trips like this; travel light and you won’t need any other luggage. Load up, sling it onto your back, and when you finally get through security you can march right onto the plan with it. A friendly guy in LAX commented that it must be difficult to travel with my backpack because I couldn’t pull it on wheels through the airport. I suppose that’s true for some people, but I’ve chopped down a tree and crapped in the woods; carrying my bag isn’t really problematic for me. During my recent camping trip at Sand Ridge State Forest, I hauled everything I took with me in my Volta (or strapped to the outside, to be fair). I packed pretty light, but I still have a lot to learn about reducing what I’m bringing along. On this trip, I packed a base layer made by 32 Degrees, a heavier mid layer by Cold Pruf, a North Face pullover, a pair of wool socks to sleep in, an all-purpose waterproof shelter made by Hammock Bliss, a Gerber Freescape Camp Saw, all my food and water for the night, my headlamp, and a book to read by the fire. With all this stuff, the Volta was stuffed pretty full. Then I strapped a cheap sleeping pad on the top with a bungee cord and I was ready to go! If you’ve read the post about that trip you’ll know that I ended up getting lost and covering over twice the mileage I expected to on my hike. The pack stayed comfortable for the first few miles, but eventually started to put a little strain on me. Packed to capacity, I had trouble adjusting the pack to find a comfortable position with the weight resting on my hips. If I had it to do over again, I’d try to pack even lighter to minimize that problem, but the Volta’s waist strap is pretty slim, so it can prove difficult to get the pack adjusted so that you can carry the weight with the hips. 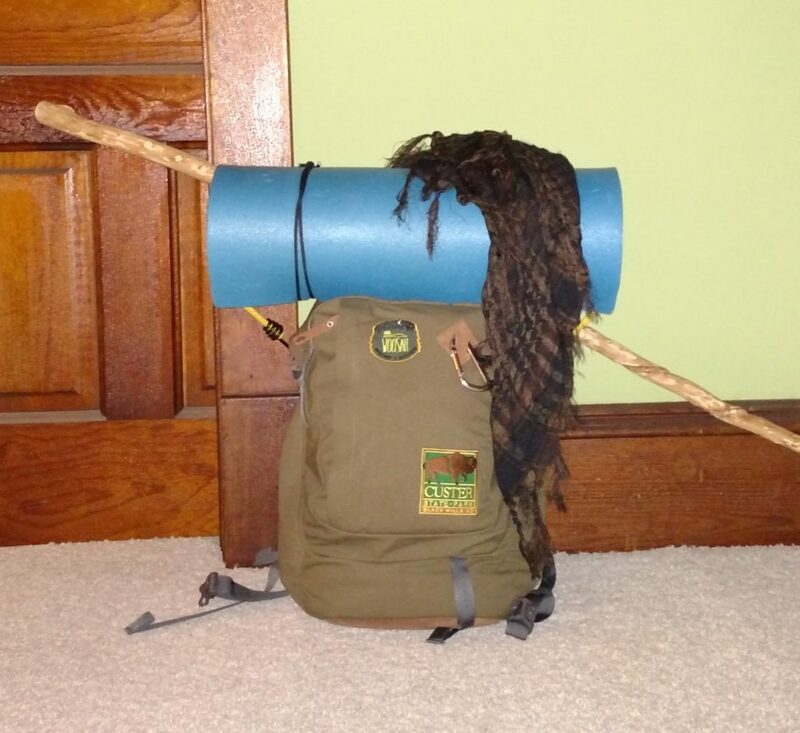 The reason this is challenging, however, is that the Volta isn’t a backpacking pack. I’m asking it to do more than it was designed for, and it answers the call pretty damn well. Aside from minor discomfort, the Volta performed admirably on this trip, and I’ll take it on additional overnight trips in the future. 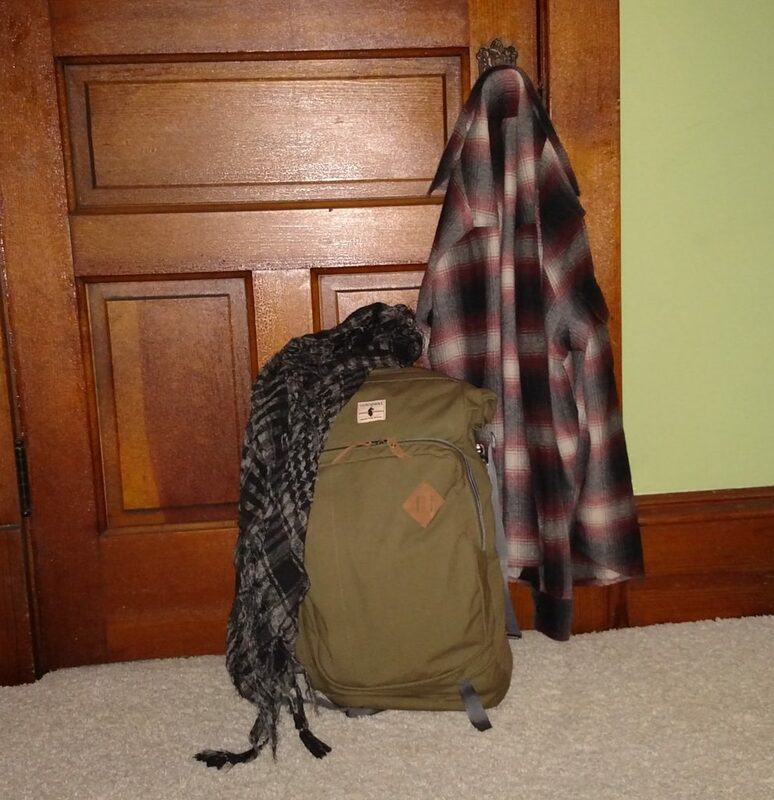 The Volta continues to be my go-to bag for when I visit home (central Illinois) or my in-laws (South Dakota). I always have more than what I need, and it travels well. Mom’s cat hasn’t attacked it, so it must be fine. Despite being tough and resilient it won’t look out of place walking around a city, and there are loops for keeping the zippers in place making them more difficult for someone to open without you noticing them. Unfortunately, there isn’t a method for locking the side zipper (although you could lock the dual zippers on the laptop compartment). The front pockets have some organizational netting and zippers, so you can store pencils, pens, flash drives, and other small items without them getting lost in the bottom of the pack. When I head home or elsewhere, it generally carries everything I need, unless I’m doing labor for mi madre. The Volta has a dedicated pouch for your laptop, with extra padding on both sides. Storage capacity. You can fit lots of stuff in this pack. You read above what all I fit into it on a few different trips. It would easily accommodate enough clothes for a week of travel, more if you know how to layer and pack light. In my previous review I suggested that if you pack light you might be able to take it on a backpacking trip lasting anywhere from a weekend to a week, but after spending time with it stuffed to capacity on the trail, I have my doubts that I would want to take a backpacking trip longer than a weekend. Maybe if you have access to one of the bivy-systems that packs down incredibly small and light, you could go farther and longer. 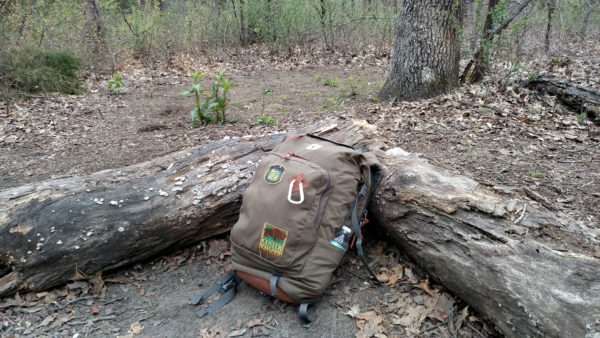 That being said, I will happily carry my Volta on weekend trips in the woods, but I think I’ll use a larger pack for longer backpacking trips. Rugged but lightweight. A year later and it has still stood up to my abuse. It is starting to show some scratching, and some minor discoloration on the leather bottom, but for as much as I’ve tossed it around, I’m happy with its performance. You can count on the Volta standing up to whatever you have to throw at it. Despite its toughness, it’s lighter than expected. Weighing in at just under two and a half pounds, you’re definitely not in the elite ultralight gear zone, but you’re not looking at an insane amount of weight. Water resistant. Light rain or snow won’t be a problem. The roll top seals out water very effectively. The side zipper isn’t waterproof, but I’ve had no problems with water seeping in. Testing out the water proofing. I’m sure if you expose the Volta to water long enough it will start to take on some moisture. That being said, in the above water test, I let water pool on the pack’s surface for thirty minutes with no noticeable absorption. 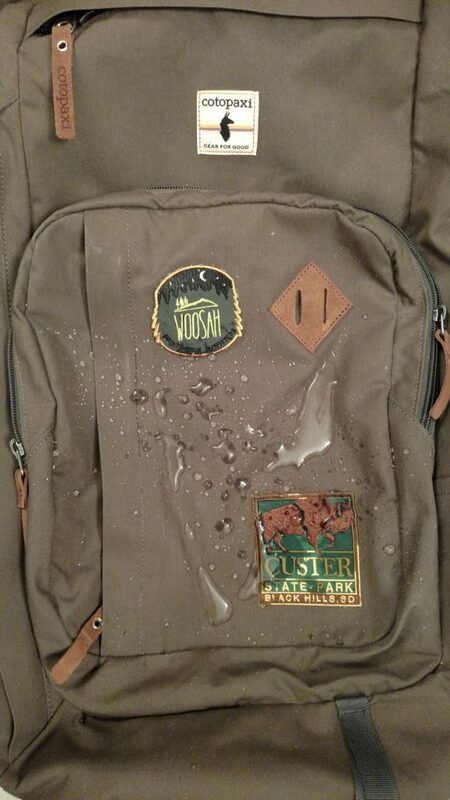 I’d recommend covering your pack if you’re in a downpour, and avoiding leaving it in puddles; do that and your Volta won’t have any problems with water. Multi-use. Car-camping, air travel, light backpacking, visiting other cities, weekend trips. This pack isn’t limited to one use, which makes it well worth its price. It looks great, so regardless of what you’re doing or where you’re going, you won’t feel out of place. Cotopaxi offers three colors, so you can pick whatever suits you best. Cost. The Volta isn’t super expensive. Given the quality of the pack, it’s downright inexpensive. I mentioned above that the pack is heavier than high performance ultralight gear. It’s also a fraction of the cost. At $110, you get a lot of uses out of the Volta for not a ton of money. Those are some solid Pros… I’ll be honest, I love this pack. But nothing is perfect, so let’s review some of the Cons. No internal structure. If not full, things will shift and move around. With the exception of the laptop compartment and the external zippered sections, any compartmentalization will need to be done manually using stuff sacks. This won’t be a problem with a solid load, but if you’re going on a day hike with a light load, expect your stuff to move around and plan accordingly. This is pretty par the course when it comes to a rolltop, but if you’re not used to that it can throw you off a bit. No internal support. Likewise, It can be tricky, when the bag is full, to figure out the best adjustment so that the weight is distributed through your hips well. This isn’t a problem when you’re carrying a light load a short distance, or even a heavy load over a short distance, but throw a full load in the pack and carry it for a few miles, and you’re going to need to do some adjustment to get it well-situated. Once you find the sweet spot, you’ll be good, but it can take a bit of effort to get there. The side zipper, while handy, isn’t perfect. The Volta’s usefulness isn’t limited to the outdoors. It blends well in the airport or city street, but the side zipper only has one pull, so you can’t put a lock on it. You should always be aware of your pack while you’re on any city streets, and there is a “zipper minder” to help prevent unwanted opening, but it would be nice to have the option to lock it up. 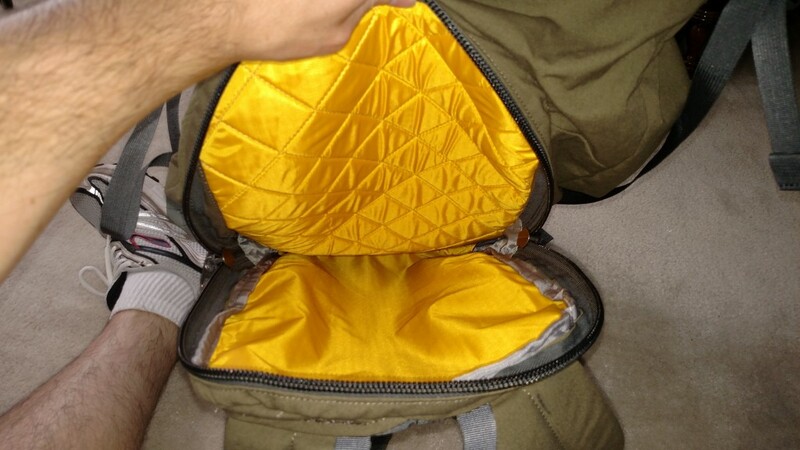 The laptop compartment, however, does have two zipper pulls, so you could rig a lock to the two of them. The usefulness of the side zipper is limited by how well you plan in advance; if what you’re looking for is on that side and the pack isn’t stuffed to capacity you’ll be good to go. But if you’ve stuffed the bag full, it will be easier to just unroll the top than it would be to try to root through the side zipper for something on the opposite side. If you plan ahead, however, and pack things you might need to access in the proper spot, the side-zipper is a good feature. So how does my praise hold up a year later? Everything good I’ve said about this backpack is absolutely true. It’s not perfect, but it’s an awesome pack; one year later, I still love the Volta. It’s seen more use and abuse, been hauled outdoors, stuffed in overhead compartments, dropped down the stairs (oops) and it’s still going strong. That isn’t to say that my opinions on the Volta haven’t evolved at all; except under specific circumstances I wouldn’t use it as a daypack anymore (I’d wear the Luzon instead), and using it for camping beyond a day or two (or out of the car) would prove challenging. But it’s still one of the best pieces of gear that I own, and it serves multiple uses incredibly well. 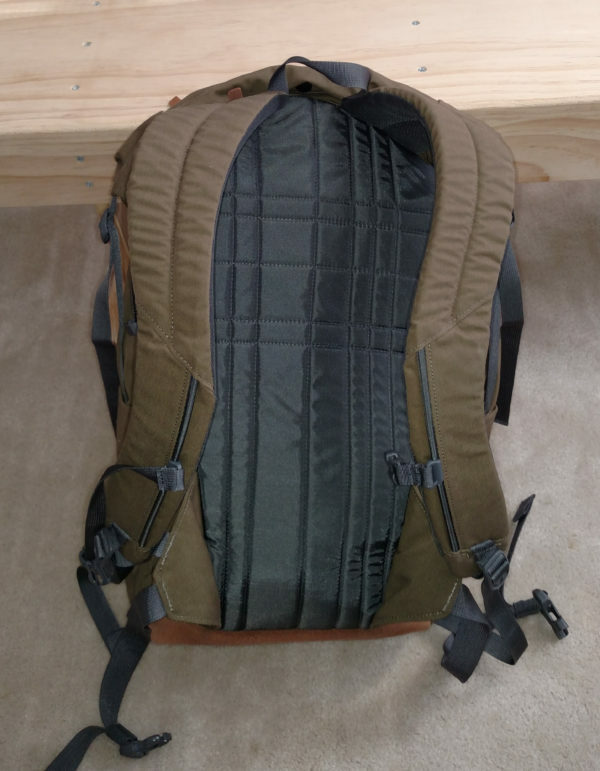 It’s my opinion that the pros strongly outweigh the cons when it comes to this backpack and I can still say that this is the best all-around pack I’ve ever owned. There are better daypacks, technical packs, and carry-on bags out there, but I’ve never had a multipurpose pack that is equally at home camping, visiting friends in different cities, or spending a weekend away. The Volta is worth every penny, and a year later it still carries my recommendation! There is the added benefit of knowing that when you buy from Cotopaxi, you’re supporting a company that believes in adventure, and for whom supporting non-profit efforts isn’t just an after thought, it’s their business model. There are a lot of companies that like to say that they care about the world, but Cotopaxi does more than talk the talk. In fact, they do more than walk the walk- they blaze a trail. Would I recommend buying a pack simply because Cotopaxi is helping people? No (but they do have really comfy t-shirts that you could buy and still contribute to humanitarian efforts, just saying). But they make a really damn good pack, and if you’re in the market, you should think about Cotopaxi. Seriously, you should go check ’em out. I see my scarves! Haha. Been thinking of getting a hiking bag, but haven’t settled on one yet. May look into this one when it’s time to make that purchase!